Morphy Auctions’ October 2017 Premier Automobilia and Petroliana Sale to Feature a Top Tier Selection of Desirable Signage, Globes, Pumps and Other Vehicle Themed Ephemera. This can’t miss auction goes into overdrive with the most collectible and interesting category offerings in the marketplace today. Denver, Pennsylvania, September 1, 2017 – Morphy Auctions, the finest auction destination for fresh to the market collections, is excited to announce this 460-lot sale to be held on Monday, October 2, 2017. Bidding starts promptly at 9:00am, east coast time. Morphy’s is internationally recognized for its leadership in automobilia and petroliana and holds several sales records within these important categories. All lots from this October event are on display in Morphy’s Denver auction gallery and are available for preview now. It’s signed, sealed, and delivered with this sales sections of outstanding vintage and antique signage. Things are twice as nice with a number of spectacular double sided porcelain signs. Lot #279, a red, white, and black Frontier “Rarin’-to-Go” keyhole identification sign with very good color and gloss features a man riding a bucking bronco. It is marked “Ing-Rich Tulsa” and is estimated at $7,500-15,000. Lot #112, a round Mustang Oil sign also features a handsome horse on an orange and teal background and is estimated at $6,000-8,000. It’s the dawn of a new day with lot #192, a Sunray D-X Petroleum Products diecut sign. It is decorated with a rising sun and is estimated at $4,000-6,000. And lot #116, a rare size Republic shield-shaped sign marked “Ing-Rich Beaverfalls, PA” is estimated at $3,000-6,000. Our experts have never seen this sign in this oversized version before. This sale’s selection of singled sided porcelain signs is also one in a million. Standing head and shoulders among the competition in this category is lot #81, a Hood Tires Flagman six-foot-tall sign with very nice color and gloss. It is estimated at $6,000-9,000. Lot #83, a Wyeth Tires sign featuring a little boy sitting in a pile of tires, is marked “Burdick” and is estimated at $10,000-20,000. Moving right along, all eyes will be on lot #272, an International Harvester Trucks Tractors Farm Equipment sign, estimated at $6,000-9,000. Marked “Walker & Co.”, it consists of two singled sided diecut signs mounted back-to-back with a thin can and is mounted under a lighted hood. And lot #273, a Husky Dogs diecut sign made from two singled sided multi-piece signs mounted back-to-back with a small original can, is marked “Texlite” and estimated at $10,000-20,000. Signage featuring neon or neon components are another bright spot in this sale. Lot #117, a Marathon Best in the Long Run diecut sign with excellent gloss and color is certain to medal with its $10,000-15,000 estimate. This is a rare sign that was made for neon and went on the top of Marathon stations. And bird’s the word with lot #411, a Case/Old Abe sign featuring a globe and proud eagle. This sign is made from two diecut neon signs mounted on a can; both sides have excellent gloss and color. It is estimated at $10,000-15,000. It’s time to focus on this auction’s comprehensive selections of museum quality globes and lenses. Two single globe lens examples from Gilmore featuring the company’s famous lion logo are the kings of this category. The first is lot #58, a Gilmore Red Lion plus Tetraethyl lens, estimated at $10,000-20,000. And the second is lot #59, a Roar with Gilmore single globe lens, estimated at $8,000-12,000. Both are in excellent condition and are housed in new HP metal globe bodies. Lot #430, a pair of Husky Hi-Power globe lenses featuring a blue and white dog in a new LP metal globe body, is another top dog highlight and is estimated at $3,000-6,000. And lot #290, a Dixie Gasoline Knock-Out keyhole globe is estimated at $7,000-12,000; this fantastic blue and yellow oval example retains its original Cincinnati Advertising Company decal. 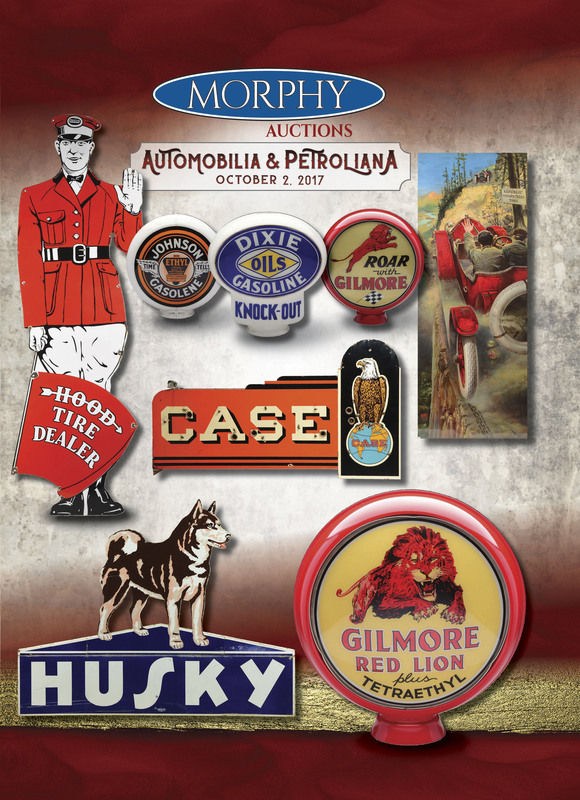 This comprehensive sale rounds out with a fifth gear selection of other transportation related collectibles, including posters and prints, thermometers, oil cans, pumps, displays, and other rare ephemera – including lot #85, a Republic Staggard Tread Tires poster, estimated at $10,000-20,000. This visually stunning piece captures the iconic image of two early cars meeting on a narrow road. Also worthy of a double take is lot #441, a Canadian Double Ten Gallon visible gas pump complete with two triple etched glass cylinders and its original brass nozzles and handles, estimated at $10,000-15,000. Morphy Auctions, the finest auction destination for fresh to the market collectibles, is headquartered in Denver, PA. The company also has a satellite office in Las Vegas, NV. A full-service auction house, Morphy’s presents over 35 premier auctions annually. The company’s three-part mission includes ensuring consignor satisfaction with every auction, offering world-class customer service that goes above and beyond the call of duty, and providing relentless buyer support to create confidence for all clients seeking a trustworthy purchasing experience. Morphy’s team of specialists includes the nation’s finest and most recognized experts in popular collecting categories including advertising; firearms; fine automobiles, automobilia and petroliana; coin-operated machines; antiques, fine, and decorative art; dolls, bears, toys, and trains; cast iron; coins; marbles; jewelry and wrist watches. Morphy Auctions is owned by President and Founder Dan Morphy, himself a lifelong and passionate collector of antiques, banks, and numerous other categories. Morphy’s has been in business since 2004 and has grown from two to over 65 employees in over a decade. Morphy Auctions is located at 2000 North Reading Road, Denver, PA 17517. We can be reached by phone at 877-968-8880, by fax at 717-336-7115, and by email at info@morphyauctions.com. Our auction gallery is open seven days a week: Monday through Friday from 9am to 4pm and Saturday and Sunday from 9am to 1pm. For more information on Morphy’s, please visit www.MorphyAuctions.com.